When you decide to start trading or investing in a company or other, the things you’re most interested in are dividends. They represent items that will generate revenue from your trading. However, one thing all beginner traders need to know is that not all dividends are the same. The differences might seem small at first glance, but they actually have a big impact on your returns. Here is a short guide on qualified dividends and what sets them apart from the rest. The first thing you need to know about dividends is that there are two types – qualified and unqualified. This article aims to define the qualified ones. The main aspect that sets them apart is tax. When it comes to paying taxes on your trading returns, that’s when you’ll see why differentiating them is so important. Taxes, as we all know, can affect your general income, to a bigger or smaller extent. By definition, a qualified dividend is that particular type that gets taxed at the capital gains tax rate. 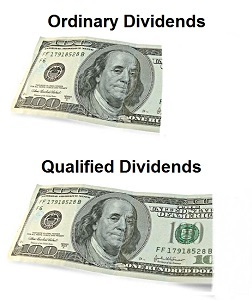 To make the matter easier to understand, as a rule, most dividends are qualified. However, this applies to dividends coming from regular US companies, with a traditional structure, such as a corporation. Dividends belonging to individuals, estates, and trusts are always taxed at a rate of 15%, which is the current capital gains rate. There are also individuals who have an income tax rate of 10% or 15%. For them, the capital gain tax rate is zero. Qualified rates are always lower than a typical income tax rate that applies to unqualified dividends. This is why non-qualified dividends do not make the cut for lower tax preference, according to the rules. The result is that they are taxed at the individual’s regular income tax rate. To put it all in the shape of a simple piece of information, if you have non-qualified dividends, you will pay far more taxes than for the qualified ones. What Requirements Are there for Qualified Dividends? The simple truth mentioned above about paying far less tax, if you happen to have qualified dividends rather than unqualified ones, sounds very good. However, investors do have to meet a certain set of requirements to benefit from the deducted taxes. The most important of them refers to the minimum period of holding. You need to adhere to a minimum period of holding. As far as common stocks go, a share has to be held for at least 60 days in a 120-day time period that begins 60 days before the ex-dividend date. As far as preferred stocks go, the time period changes to 90 days in a 180-day period that begins 90 days before the ex-dividend date. Naturally, if you manage to meet this criterion after you get paid, then your dividends are qualified. Ordinary vs Qualified Dividends: Which Is Which? Sometimes judging your dividends by the holding period criterion can be a daunting task. Therefore, here are some examples that might help you understand which kind you own. Dividends that come from mutual funds. Qualified dividends can come from any company whatsoever, as long as that company is considered qualified by the IRS. They can also be issued by foreign corporations, as long as the IRS considers them qualified as well. The requirement for that is as follows – the foreign corporation has to be “incorporated in a possession of the United States or eligible for benefits of a comprehensive income tax treaty with the United States that the Treasury Department determines is satisfactory for this purpose and that includes an exchange of information program”, as the IRS itself states. This basically means that the foreign corporation must be linked in some way or another to the USA. Apart from that, the company has to be located in a country that has an agreement with the IRS in place. This particular piece of information about qualified dividends is very important for American citizens who are shareholders in foreign companies. If that particular company is not tied to the US or is not in a country America has an agreement with, then the dividends will not be recognized as being qualified. Here’s a look at how qualified dividends have been taxed in the past years. From 2003 – 2007, qualified dividends have been taxed at either 15% or 5%. That depended on an individual’s tax bracket. From 2008 – 2012, the tax on qualified dividends was reduced to zero for all taxpayers that were included in the 10% or 15% brackets for ordinary income tax. Starting from 2013, the rates are 0%, 15% and 20%. The latter was designed for taxpayers in the 39.6% tax bracket. First of all, you need to determine the number of shares you have that meet the holding period requirement. Then you must find the portion per share of any qualified dividends. For each and every one of them, you need to multiply the two amounts so that you can determine the amount for every qualified dividend. Let’s say, for example, that you have 8000 fund XYZ shares. The qualified dividend per share is of $0.09. When you multiply the two, you see that the amount of actually qualified dividend is $720. Had you reported, let’s say, $1800, out of them as ordinary dividends for XYZ fund, only $900 will be reported as Qualified Dividend. Out of those $900, $720 will be taxable. One of the more favorable rates will be chosen. What remains are some $1,080 of dividends reported. This amount will be taxed as part of an individual’s ordinary income tax rate. As its name suggests, this is a worksheet or a taxation you are required to fill in while doing your taxes. Many people find it difficult to complete it. However, the difficulty doesn’t come from the sheet itself, but rather from the concept behind. Therefore, let’s break it down and see what there is to be done about it. Since this part of the article discusses the tax treatment of the dividend worksheet, it’s important to mention that it has 27 lines and two sets of progressive rate schedules. The first set is for your normal income and the second is for your corporate qualified dividends and your capital gains. As far as brackets are concerned, you will find some 73 types. The cutoffs for these brackets stand on the combination of the two types of income mentioned above. This means that a higher income will guide you towards a higher dividends brackets. Simply put, a lower income will not. There are problems indeed with filling out this worksheet, as mentioned. They come from the fact that, as far as corporate integration goes, there is a serious lack of concept there. Taxes based on shareholders in corporations are divided into two distinct parts on the worksheet. These are the corporate income tax and the individual tax based on dividends. Many people have argued that, should everything be moved in a short and simple one-part tax, things would be a lot easier. Dividends would be then treated as normal income. However, they are not. This means you have to pay attention to both sheets and complete them accordingly. There are other countries, such as Australia that have managed this problem successfully. They integrated the corporation part into the rest of the worksheet. This could serve as a great example, should we ever desire to simplify the tax code. If you are not sure about the way in which you need to complete the Qualified Dividends and Capital Gain Tax Worksheet, ask for instructions from a specialist. It’s a very serious matter, and one shouldn’t make mistakes. Also, you need, to know for sure if you are a qualifying subject for the type of dividends in question before you start completing it. As a general rule, you need to remember that Qualified dividends are reported on Line 9b or 44 of a 1040 or 1040A form. These are the forms you might still find available. Nonetheless, keep in mind that 2016 has brought on a new type of form – File Form 1099-DIV, Dividends and Distributions. 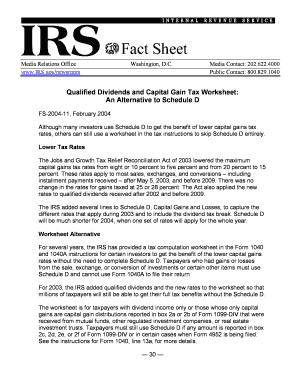 You might need this one to report your qualified dividend income and calculate your taxes. Understanding and calculating qualified or non-qualified dividends is not a very difficult thing to do. However, since this is quite a sensible issue, it’s best you refer to a professional that can help you. It can be either a broker or an accountant. Both will explain to you all the ins and outs.